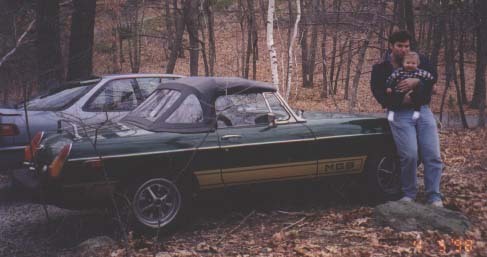 March, 1998: After all those years of talking about it, I finally bought an MGB. It's a 1980, in pretty good shape. Something tells me that it'll become another typical Steve Shoyer project (like the cradle), but so what. Claire seems to like the car, but I'm not sure where the car seat will go (it's not like there's a back seat, or much room in the front seat for that matter). Update (March 2000): I've had the car for about two years, and it does seem like it's been one of my typical projects (here's a list of things I've bought and/or done to the car so far). I think I paid too much, because I've found a lot more rust in structural areas that I saw when I was looking at it originally. I've got some parts that I still haven't installed, (like engine mounts), but I finally installed a new steering wheel that I've had for a while. I have a rule now that I can't buy more parts until I install all of the ones I've already bought, but I break it all the time. I think the biggest problem is the body rust, especially in the sills, floor, and fenders. To fix it would probably cost $3K-$4K. A new body shell would cost about $5K. It would probably cost less to buy a car in California that doesn't run but has a decent body for $1K and swap the parts. In the meantime, I'm having fun and waiting for that big lottery win so I can afford it on top of all my other expenses. It's a fun car to drive and to work on, which was the point in the beginning. Claire likes it too; we drive up and down the driveway (Mom doesn't let us out on the street), and she likes to shift the gears. Not bad for a three-year-old. Update (June 2000): The car run OK after the carb swap, but I still need some parts and tuning to make it work well. I've arranged for some bodywork to be done over the winter, so at least the car should be safer from that perspective. I don't know what else I'll do to the car this summer, maybe replace the fuel tank and try to clean it up a bit more. Here are some pictures from the MG Day 1998 and MG Day 2000. I took pictures at the 1999 MG Day too, but I haven't been able to find the images, and I don't have the camera anymore A shame, because I had lots of pictures of 1972-1974 SU carbs like the set I have installed. Update (March 2002): I had the sills repaired last year, and now most of the rust holes are gone. It could still use a few things, like repainting and a new interior, but the car is running well and is structurally sound, which is good. Pictures from MG Day 2001 are available, and in a few months there should be a new set. Update (November 2002): The car caught on fire, but it's just about back on the road. It's taken about six months to repair the damage, working on and off. Update May 2012): It's been a while. I've rebuilt the suspension and most of the braking system over the past decade. The clutch slave cylinder was leaking, so I just put in a replacement. While I was under the car, I finally reconnected the wiring for the overdrive, so that's working after ten years. I've got a new interior (carpets, panels, and seats) that I've started installing. I also have a new heater core that I've been saving for a while, as that was one job that I hated, but maybe I'll get around to installing it with the interiot panels. I hope the car will look good for the summer.